Departamento de Ciencias Fisiológicas, Facultad de Ciencias Biológicas, Pontificia Universidad Católica de Chile, Alameda 340, Santiago, Chile. Angiogenesis, the development of new capillary vessels, has a host of clinical manifestations. The identification of agents that increase or decrease angiogenesis is of great pharmaceutical interest. Classically, in vitro angiogenesis utilizes human umbilical vein endothelial cells (HUVEC) grown in matrigel. This valid and simple method has the drawbacks that each cell population is distinct and the constraint of obtaining primary source material. Herein we utilize the established EA.hy926 endothelial cell line as our model for in vitro angiogenesis and present a novel formula to quantify endothelial cell remodeling to identify pro- and anti-angiogenic agents. Furthermore, our technique details the procedures to identify and quantify compounds that have the capacity to generate pro- or anti-angiogenic factors when given to non-endothelial cells, which we define herein as angiogenic potential. In conclusion, we propose a novel formula that we are confident accurately reflects the degree of in vitro angiogenesis allowing the quantification of prospective angiogenic compounds. Key terms: angiogenesis, EA.hy926, HUVEC, endothelial, formula, in vitro assay, matrigel. Angiogenesis is the development of new capillary vessels. The development of pro-angiogenic and anti-angiogenic drugs has the potential to deliver novel and effective therapy directly targeting angiogenesis-dependent pathologies (Gerstner et al., 2007; Pluda, 1997). Of a host of clinical manifestations that could benefit from anti-angiogenic therapy are cancer, inflammatory disorders, diabetic blindness, age-related muscular degeneration, psoriasis, cardiovascular and autoimmune diseases, among many others. Clinical presentations that could benefit from pro-angiogenesis drugs are coronary artery disease, stroke and delayed wound healing. In cancer, the survival and subsequent metastasis of solid tumors appears to be dependent on neovascularization of the primary tumor, ensuring an adequate supply of oxygen and nutrients (Folkman and Shing, 1992). In the first stages of screening for potential pro- or anti-angiogenic compounds a simple in vitro assay is required to give an initial indication of effectiveness and thus lower the requirements for more cumbersome and expensive in vivo animal models. The in vitro assays used to investigate angiogenesis are multiple and work on the simple principal that the formation of capillary-like structures in matrigel (a trade name from BD Biosciences for a gelatinous protein mixture secreted by mouse tumor cells that resembles the complex extracellular environment found in many tissues) extrapolates to angiogenesis (Goodwin, 2007). Assays generally focus on the use of Human Umbilical Vein Endothelial Cells (HUVEC), which are isolated from normal human umbilical vein. Although several private companies currently offer these cells, they are expensive, require testing for pathogens and vary from lot to lot. Generally, scientific laboratories depend on collaborations with local hospitals for the procurement of human umbilical vein and their subsequent isolation and primary cell culture. An alternative in vitro model for angiogenesis was established in 1983 with the creation of EA.hy926 cell line (Edgell et al., 1983, 1990; Bauer et al., 1992). The establishment of the EA.hy926 endothelial cell line was reported by Dr Cora-Jean S. Edgell of the University of North Carolina, Chapell Hill, NC, USA. This cell line was obtained by the hybridization of human umbilical vein endothelial cells with the A549/8 human lung carcinoma cell line, yet interestingly for models of angiogenesis in vitro, has maintained the phenotype of endothelial cells. This cell line demonstrates highly differentiated functions that are characteristic of human vascular endothelium, while offering the advantage of immortality, stability through passage number and, as with any cell line, the reproducibility of results (Edgell et al., 1983, 1990). More specifically, Dr Edgell and other investigators have demonstrated that EA.hy926 cells express endothelin-1, Weibel-Palade bodies, prostacyclin, factor VHI-related antigen, endothelial adhesion molecules ICAM-1 and VCAM-1, as are characteristic of pure endothelial cultured cells (Edgell et al., 1983, 1990; Emeis and Edgell, 1988; Thornhill et al., 1993; Saijonmaa et al., 1991; Van Oost et al., 1986; Suggs et al., 1986). The EA.hy926 cell line has also been reported to be a preferable homogeneous experimental model because it permits more consistent responses to specific variables and greater reproducibility of data (Eremeeva and Silverman, 1998). In 1992, Bauer et al., (1992) showed that EA.hy926 cells are capable of undergoing tube formation when grown on matrigel. Endothelial cells of all origins grown on martigel appear able to form tubules spontaneously, as has been demonstrated by the wide range of endothelial cells used in this process (refer to the column "model" in Table II). Thus the matrigel assay of tubule formation has become a useful in vitro assay to observe at least two key steps in the angiogenic pathway; migration and differentiation of endothelial cells. Until recently, the methods to evaluate angiogenesis in vitro were mostly descriptive, i.e. the presence or absence of tube formation or three-dimensional cell organization angiogenesis was reported. However, it soon became clear that certain anti- or pro-angiogenic factors/drugs decreased or increased angiogenesis in vitro more than others, thus creating the requirement for a quantitative assay to measure these differences. The first quantifications used length measurements of tube-like structures as an angiogenic index (Yamagishi et al., 1997). In 1998, Jones et al., counted the number of connected EA.hy926 cells and divided that number by the total number of cells in the same microscopic field. The technique of measuring branching or sprouting, combined with tube length and/or number of connecting tubes has become the most commonly used estimation of angiogenic potential using any endothelial cell system reported in the literature. Interestingly, during an exhaustive search of the literature, we found that no common formula was applied and in most cases the method of quantification was not stated. Although, each of these methods gives an indication of angiogenesis in vitro in relation to the compound under analysis, these methods are not suitable to detect small changes. As will be elaborated in greater detail in this paper and in accordance with previous reports in both EA.hy926 cells and HUVEC models, there is a reorganization of endothelial cells once cell-cell contacts have been formed and this organization changes over time. Most importantly for the creation of an angiogenic model, we have observed that this formation of a "complex mesh" occurs in the presence of certain angiogenic factors, but not all. More recent papers have studied branch points and the area covered by tubules (Movafagh et al., 2006; Xu et al., 2008). Guidolin et al, (2004) described an image analysis method based on topological and fractal parameters (refer to table II) to evaluate tube formation. They both suggest dimensional parameters as a measure of the number of formed tubules. In 2006, Lake et al., assigned numeric values based on the quality and number of the tubes. In 2008, Basu et al., (2008), analyzed angiogenesis in vitro with an automated algorithm that identified the tubes formed by association and clustering of endothelial cells. All of these studies provide measurement of different steps of angiogenesis. Herein, we demonstrate the progression of tube formation in matrigel using the EA.hy926 cell line, and present a formula that we believe best integrates each step of this in vitro process to allow quantification and thus deliver the potential to distinguish between two or more compounds or the analysis of the effect of combinations of such compounds. This is accomplished by the assignment of a numeric score to each step of the process from "sprouting", through the formation of "polygons" or "honeycomb patterns" to the formation of "complex meshes". This method and formula we believe gives an accurate numerical value to prospective compounds in a simple, inexpensive and rapid manner, thus facilitating the analysis and interpretation of the results obtained in in vitro angiogenesis assays, both in industry and in the scientific laboratory. Is a compound "angiogenic" or does it possesses "angiogenic potential"? There are two methods commonly used by which compounds are tested for their role in angiogenesis. Firstly, endothelial cells or endothelial derived cell lines are grown on matrigel in the presence of a compound under examination, with the resulting formation or inhibition of capillary-like structures. In this scenario, the compound under investigation can directly stimulate or inhibit the remodeling of endothelial cells. These compounds are referred to as pro- or anti-angiogenic. The second method examines the potential of a compound to stimulate angiogenic or anti-angiogenic factors and is accessed by adding the compound to a separate cell line, primary cell culture or tissue, then after a given period of time deemed sufficient to allow the liberation of angiogenic factors, the medium is collected (now referred to as conditioned medium), incubated with endothelial cells in matrigel and the formation of capillary-like structures is examined. Herein, we have given the name angiogenic potential to the capacity of a compound that, when given to non-endothelial cells, can generate conditioned medium capable of increasing (pro-angiogenic potential) or decreasing (anti-angiogenic potential) the formation of capillary-like structures in cultured endothelial cells or endothelial cell derived cell lines. 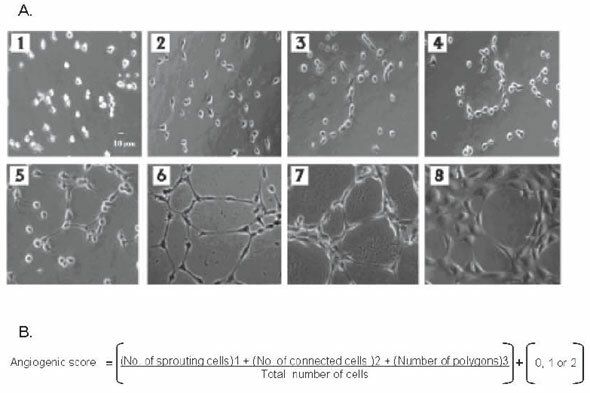 The endothelial cell line EA.hy926 cells was maintained in Iscove's Modified Dulbecco's Medium (IMDM, Invitrogen, NY, USA/Sigma Aldrich) with 10% fetal bovine serum (FBS) (Invitrogen, NY, USA/Sigma Aldrich ) in the presence of 100 U/ml penicillin G, and 100 mg/ml streptomycin sulfate (Invitrogen, NY, USA) at 37°C with 5% C02. In this measurement of angiogenesis in vitro, conditioned medium (CM) from cancer cell lines was obtained by incubating sub-confluent 60 X 15mm tissue culture grade Petri dishes (Falcon, Becton Dickinson, Lincoln Park, NJ) with 2 mi of serum-free (SFM) DMEM F12 (Dulbecco's Modified Eagle's Medium F12). By their nature, cancer cell lines possess basal pro-angiogenic activity and thus medium taken from these cultured cells will allow a certain degree of endothelial cell reorganization. Higher basal endothelial cell reorganization, preferable with screening potential anti-angiogenic compounds, can be achieved by the addition of previously identified pro-angiogenic factors (pro-angiogenic cocktail). The addition of serum will also raise the basal leveis of EA.hy926 endothelial cell reorganization. For the measurement of angiogenic potential, the compound under examination was added to medium covering cancer cells in culture. After a 24-hour incubation, the medium, now termed CM, was collected in a Falcon tube (Falcon, Becton Dickinson, Lincoln Park, NJ) and centrifuged at 3000 X g for 4 minutes to remove cell debris. This CM was then used to resuspend and plate the EA.hy926 cells onto matrigel. Previously, 0.2 mi of matrigel (BD Biosciences, New Bedford, MA) was dispensed per well into 24-well tissue culture plates (Falcon, Becton Dickinson, Lincoln Park, NJ) using a cold pipette to avoid the formation of bubbles. The matrigel was polymerized for 1 hour at 37°C with 5% C02. EA.hy926 cells were trypsinized and 40,000 cells were plated onto matrigel in the presence of CM or compounds under investigation for their pro- or anti-angiogenic activity. The EA.hy926 cells were observed periodically and photographed using inverted phase contrast photomicroscope with a 20X objective. 10 representative images per well were recorded and transferred to the computer for image analysis. For the purposes of the representative analysis performed in this paper, the ZR-75-1 breast cancer cell line (Engel et al., 1978) was maintained in DMEM/F12 media supplemented with 10% FBS (Invitrogen, NY, USA) in the presence of 100 U/ml penicillin G, and 100 mg/ml streptomycin sulfate (Invitrogen, NY, USA) at 37°C with 5% C02. A pro-angiogenic cocktail, consisting of epidermal growth factor (EGF, at a final concentration of 10 nM in culture medium, Upstate Biotechnology, NY, USA), Factor Vlla (10 nM in culture medium, Sigma-Aldrich, St Louis, USA) and progesterone (a final concentration 10 nM in ethanol, Sigma-Aldrich, St Louis, USA), was add to the breast cancer cell line 24 hours before the medium was collected. In the presence of this pro-angiogenic cocktail, sprouting began around 1-2 hours and the remodelling was complete at approximately 12 hours. For the purpose of demonstrating anti-angiogenic activity, we utilized the known anti-angiogenic estrogen metabolite 2-methoxyestradiol (2ME, Steroloids, Inc, Wilton, NH, USA) (Mabjeesh et al., 2003; Ricker et al., 2004; Brahn et al., 2008) at concentrations stated in the corresponding figure legends. To demonstrate pro-angiogenic potential, we utilized Factor Vlla at a final concentration of 10 nM in CM pertaining to ZR-75 cells not treated with the above-mentioned angiogenic cocktail. Statistical analysis was performed by student t-test analysis with significance set at p<0.05. Bars represent ± SD (standard deviation) of the mean. Although the growth of EA.hy926 in matrigel has been documented, in the following section we report the process in more detail to introduce our terminology and to justify a numerical association at each step. A critical factor is the number of EA.hy926 cells plated onto the area of matrigel. Too few cells cannot form networks, while too many cells make counting and the interpretation of results more difficult. When seeded onto matrigel in the presence of appropriate media (serum or factor containing medium or CM from cultured cells), EA.hy926 starts to reorganize within the first hour. The cells start out as spherical forms (Panel 1, fig. 1), but quickly flatten and begin to show projections. This process is commonly referred to as sprouting (Table I; Panel 2, fig. 1). During this time, cell migration is observed, resulting in closer proximity of the EA.hy926 cells. This is a phenomenon that will continue throughout the process. These sprouts connect with similar projections originating from other cells to form a cell-cell contact, to which we designate the name connected cells (Table I; Panels 3 and 4, fig. 1). This process continues between cells and may involve multiple projections from the same cell to form a series of polygon structures when observed under the microscope (Panel 5-8, fig. 1). This formation of polygon structures has also been referred to by other authors as a "Honeycomb formation" (Dorrel et al., 2002). Based on our studies, we have observed that some tested compounds have the pro-angiogenic potential to reorganize to this stage but go no further. The following stage involves the approximation of cells to form polygon structures that have a wall, which is two to three cells thick (Panel 7, fig. 1). The presence of these structures is given the name complex mesh. This stage demonstrates rapid migration and as a generalization, but not a rule, may involve the loss of numbers of polygon structures. It cannot be ruled out that during this process, in fact during the process as a whole, that cell division is occurring. However, based on our experience on counting numerous individual microscopic fields, there is not a major difference in cell number, whether the cells are undergoing tubule formation or not, nor in any individual stage of this process. This point is demonstrated in figure 2C and 2D, where the standard error represents the fluctuation in cell number in the optic fields for each condition tested. As this complex mesh develops more polygons disappear and are replaced by larger rounded structures with walls four to five cells thick (Panel 8, fig. 1). At least in our experience this state appears to be the extent of EA.hy926 remodeling in matrigel. Prolonged times or the addition of new serum containing medium does not change the form. On the contrary, if the medium is not changed after the first 24 hours, the EA.hy926 start to loss their connections, take on a darker and more rounded appearance indicative of cell death. The timing of this process is arbitrary. Depending on the angiogenic factors used, this entire process can occur within six hours or more than 20 hours. Thus, this assay is open to interpretation depending on the compound being analyzed (and the cells used to obtain CM). If the compound is under analysis to test if it has angiogenic properties, the answer is a simple yes or no. If however, two pro- or anti-angiogenic compounds are being examined, differences may need to be interpreted in terms of the kinetics of the two compounds in their ability to bring about EA.hy926 remodeling. structures. Finally, EA.hy926 cells form complex meshes of 2-3 cells in thickness (7) or more (8). Figure 1B: Formula for quantification of the angiogenic score. Table I. Definitions of terms utilized in angiogenesis assays and introduced in this paper. Tubule or tube formation, tubular structures cord, cord-like structures, cable formation, ridges, vessel-like structure, tubule or tubular branches. Remodeling ofEA .hy926 or endothe-lial cells in matrigel. The general process of cell elongation and reorganization. Polygons Honeycomb, Internal holes, Geometric tubule-like network, angiogenic structures, Closed rings. Enclosed structures in matrigel. Connected cells Cells involved in tubular structures Two or more cells joined by projectio-ns or direct cell contact. Cellular projections of EA.hy926, which do not result in contact with other cells. The ability of a compound(s) to increase (pro) or decrease (anti) capillary-like structure formation in matrigel when added directly to medium covering endothelial cells. Complex Mesh Network, Cluster of cells, Microvessel formation, Capillary morphogenesis, Capillary plexus, Tube network, Anastomotic tubes with multicentric junctions. Further reorganization of capillary-like structures after the formation of polygons. The polygon structures are reinforced with more than one layer of cells in their walls. Figure 2: Application of the EA.hy926 angiogenic assay to screen test compounds. (A) Angiogenic Potential Assay: EA.hy926 cells were incubated with CM from breast cancer cells not treated (control) or treated for 12 hours with a compound of known pro-angiogenic potential, FVIIa. Angiogenic potential is represented as the percentage change in the score for cell remodeling in comparison to control. (B) Angiogenic Assay: EA.hy926 cells were incubated with CM (derived from cancer cells treated with a pro-angiogenic cocktail) and the resulting angiogenic score derived from the formula set at 100% (Control II). FVIIa and stated increasing concentrations of the known anti-angiogenic compound, 2ME, were added at the moment the EA.hy926 cells were plated and the angiogenic score calculated 12 hours later. Values are expressed as percentage of control (control II) from a minimum of three independent experiments. *Statistical significance in respect to each control set at p<0.05. The total numbers of cells do not vary greatly between compounds under analysis or between individual optic fields. (C) demonstrates the change in total cell number in individual optic fields in a representative experiment in the presence of the pro-angiogenic factor, FVII, while (D) represents the same change for the anti-angiogenic agent 2ME. To quantify this method of angiogenesis, in vitro cells are periodically removed (we have found that bihourly analysis will suffice) from the incubator, evaluated and photographed if necessary. We have found that 10 photographs per well (per treatment) provides a more than sufficient view of the angiogenic process that is occurring. The selection of these 10 fields/photographs is arbitrary, but in the opinion of the researcher should be the most representative of the well. This approach is favorable over 10 random fields or 10 fixed fields, as cell migration plays such an integral part in the angiogenic process. For counting purposes, the formula for angiogenesis in vitro or angiogenic potential is shown in figure 1B . Each cell within the optical field is counted and this number is referred to as the "total number of cells". Each cell that shows sprouting is given a score of 1 point. When two or more prolongations unite and form connected cells, a score of 2 points is awarded to each cell involved in this process. The formation of a polygon is given a single additional value of 3 points. More than one polygon can be present per field, thus three polygons will give a total of nine points to the score given for sprouting and connected cells. These values are calculated as in formula 1, and thus the score for sprouting, connected cells and polygons is divided by the total number of cells. The presence of a complex mesh (luminal structures consisting of walls of two to three cells thick) is given a score of 1 and is added to the total value. This score is added once per optical field. If this complex structure is present and the walls are four or more cells thick, then a score of 2 is awarded. The absence of complex mesh has a score of 0 points. The individual final score derived from the formula is then taken as one value in a total of ten, with the average and standard deviation represented against other treatment conditions. Taking the example of figure 1A (hypothetically taking these panels as individual results obtained at the same time point), table III demonstrates the designation of points and the total score for the individual eight panels. TABLE II. Published models and quantifications methods. and network of well formed tubes. S ORÍ ANO et al. TABLE III. The angiogenic potential for each panel shown in figure 1. As an example of how this assay can be applied, figure 2A demonstrates the incubation of EA.hy926 cells with CM from breast cancer cells treated for 12 hours with and without (control) a known compound that possesses pro-angiogenic potential, coagulation factor Vlla (FVIIa). As is observed, FVIIa increases angiogenic potential 2-fold in this reproducible assay. Conversely, FVIIa is not pro-angiogenic (no increase is observed over control when applied directly to EA.hy 926 cells, fig. 2B). However, a known anti-angiogenic compound, 2ME, is capable of eliminating angiogenesis in this assay in a concentration dependent manner, when added to the CM (Control II) at the moment of incubation with the EA.hy926 cells. As previously mentioned, these graphs reflect EA.hy926 cell reorganization and not an increase or decrease in cell number, as demonstrated in figure 2C and 2D. This demonstrates that this assay can numerically differentiate between compounds and concentrations of each compound under investigation. In both figure 2A and figure 2B, angiogenic potential and anti-angiogenic activity respectively, are represented as the percentage change in the score for cell remodeling in the presence of respective controls. However, these results can equally be represented as absolute values of the numerical score derived from the formula. The use of the EA.hy926 cell line in matrigel is a simple and effective assay to evaluate in vitro angiogenesis. As has been reported before, this assay has the advantage of being reproducible and thus experiments are not dependent on the source of primary tissue from placenta (as with HUVEC) or the difference in response that may come with the genetic variation of each HUVEC sample. Furthermore, the assay is relatively simple, the major cost being the matrigel, cell culture plastic ware, culture medium and FBS. Other important advantages of this assay are the ability to measure both pro- or anti-angiogenic potential and the speed at which the EA.hy926 cells remodel, allowing a rapid answer to whether a compound has a form of angiogenic activity. Generally, the assay can be formed from start to finish in two to three days. However, as with any in vitro assay, drawbacks are present. Despite numerous publications, as shown in table II, no consensus is present on how to interpret and quantify results coming from this assay. The remodelling of the EA.hy926 cell line in the presence of angiogenic factors does not relate directly to processes in in vivo angiogenesis. The interpretation of whether a compound is more or less angiogenic may not reflect absolute angiogenic capability, but only give a measurement of the kinetics of the compound under investigation. Furthermore, the assay does not discriminate between a compound that is apoptotic, anti-proliferative or in fact anti-angiogenic. In this respect, we commonly perform cell viability and other functional assays on compounds that show anti-angiogenic effects in this assay. Taking into consideration the inevitable interpretations in in vitro assays, the authors believe that this is the best assay available for the rapid screening of possible angiogenic compounds and an extremely useful biological tool to measure angiogenesis in a research laboratory. Herein, using a cocktail of pro-angiogenic factors, we have analysed in detail the growth and remodelling of the EA.hy926 cell line in matrigel. We hope that this publication may contribute to both the standardization of the terminology and the quantification of this in vitro assay. After analysing over 2,000 samples, we are confident that the proposed formula will accurately reflect the degree of remodelling observed under the microscope and allow statistical differences in angiogenic potential to be ascertained between two conditions or compounds. The direct visual analysis and assignment of numerical value negates the need for computer analysis and software design present in several published quantitative assays (Guidolin et al., 2004; Lake et al., 2006; Basu et al., 2008). This quantification technique may provide an inexpensive initial screening model for applications in the pharmaceutical industry and as a research tool in the elucidation of angiogenic pathways with the research setting. The authors are grateful to Dr Cora-Jean S. Edgell for the gift of EA.hy926 endothelial cell line. This work was supported by grant 1060495 from the Chilean national funding organization FONDECYT.